This book brings together the 4 parts that were first featured as a serial adventure. It's been retooled and brought together in one cohesive 36 page adventure. Riding the winds of an Eldritch sorcery they came, bearing only a lust for chaos and evil asw well as power over the kindgdoms of men. 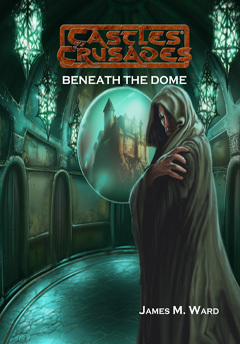 They built a fortress deep in the mountains, buried beneath a dome of rock. Though their power was great, their numbers were few, and so they cast about for minions. They captured a lone hunter, dragging him into the deeps of their temple. There they broke him and as life left him they bound his corpse to them. But he was only the first. More followed; farmers, their families, entire villages too. It was not just men and their people, but animals too; dogs and beasts of burden.